THE NEW Indian Scout is a mid-size motorcycle for someone looking for spirited performance, style, ease of riding and a low seat. Now, the Indian Scout is described as a mid-size bike, despite it displacing 1133cc – I remember thinking how my brother’s Suzuki GS850G was HUGE – but that was in the Old Days. Even further back was the original Indian Scout from 1920, and they topped out at 745cc. The first models didn’t have a front brake either: the 2015 Scout has anti-lock brakes. As a lightweight, responsive and reliable machine, Scouts in the 1930s were a popular choice for riders of the Wall of Death, the travelling stunt shows which saw riders in a wooden cylinder, riding in circles and ‘climbing’ the wall to end up horizontal, often performing acrobatics at the same time. Today, the new Indian Motorcycle Company is using that history as inspiration to build a new lightweight, responsive machine which offers excellent control, balance and performance. Indian does feature one on the Wall of Death in one of its promotional videos. The new Indian Scout is what the engineers decided the bike may have evolved into, had Indian not gone broke in the 1950s. So the riding position is actually very similar, although the footpegs are out in front a bit. And the original Scout was something of a sportsbike, but the very definition of a sports motorcycle has changed enormously in the intervening years – these days most sportsbikes are uncompromising racetrack refugees, whereas anyone who doesn’t know the history of Indian would consider the bike a cruiser. It seems sports bikes could be comfortable back in the day. The modern Scout is good looking and very comfortable. The tank, instruments, headlight, guards… most of the bike, really… is heavily influenced in its design by the earlier Scout models and Indian should be congratulated for the attention to detail they’ve gone to in making this bike so nice in so many ways. A thick solo leather seat, roomy riding position and smooth roads make for all-day comfort, provided you’re not going too fast, when the wind blast will make things tiring. 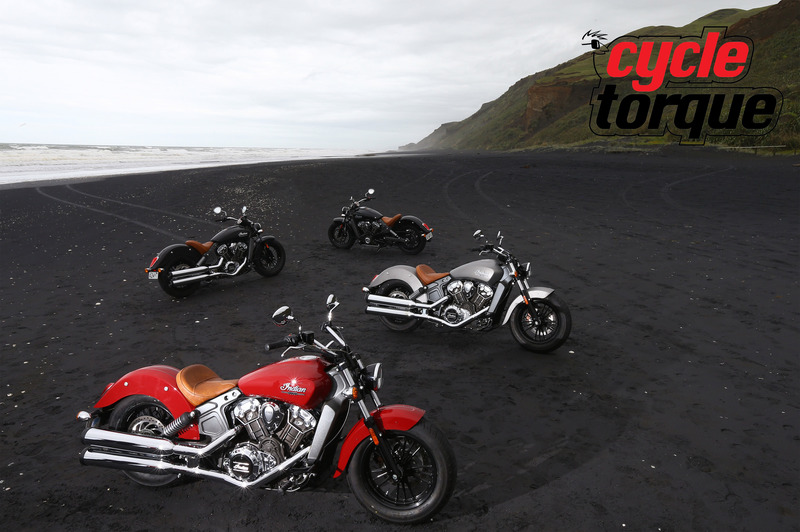 I’m a little concerned we were spoilt by New Zealand’s relatively smooth roads, too, for the Indian Scout has fairly basic suspension at both ends, and not a lot of travel, which could get tiring if the journey gets bumpy. The twin rear shocks are adjustable for spring preload, the forks are non-adjustable. The machine is long, low and relatively light. The chassis is aluminium, the wheels 16-inchers at both ends. While this mix could mean ponderous steering and poor overall handling, Indian has done a great job of making the bike handle well – I was impressed with the initial models, and the Indian Scout handles even better. Indian has a range of accessory parts to make the bike more comfortable for those very short and very tall, too. At 185cm I didn’t find the bike too cramped, but taller riders might, so you might be able make a Scout fit you better than other bikes. 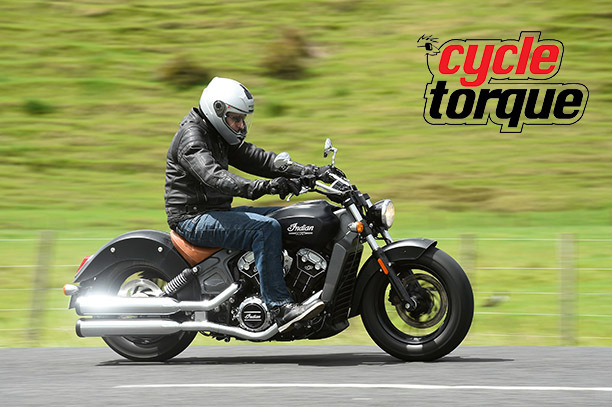 Not long ago running out of cornering clearance on a cruiser was a major indicator you were pushing a machine beyond its design limits, but the Indian Scout really feels like it wants to be ridden harder, so the better-than-average clearance for the type of bike it is still doesn’t feel like it’s enough. It’s confidence inspiring in the twisties and the 100hp engine gets from corner to corner faster than most cruisers, too. Not sure if it was cost or styling behind the decision to only fit one front disc to the Scout, but it’s a bit of a shame really, for while the brakes are ABS-equipped and adequate, they aren’t special, and could be a bit more powerful. Of course the engine has skipped a few generations. It’s much bigger than Scouts of old, of course, and it’s modern in its design, styling and feel. Gone is any pretence it’s old school – no fake air finning for this liquid-cooled 60-degree V-Twin. The stylists have done an incredible job of making the Scout’s motor look drop-dead gorgeous, painting most of it black then going to town with a milling machine to create beautiful highlights. With 100hp available and a flat torque curve, the Scout’s motor is easy to use and lots of fun. There’s enough vibration to let you know there’s a big V-twin between your legs, but not enough to annoy. Like most modern engines it wants to rev, so a little more throttle is required to get the Scout off the line compared to some other big V-Twins, but unlike older air-cooled designs the Scout’s motor doesn’t run out of puff so soon – it’ll happily rev a lot higher than most cruisers, which means you’ll go a lot faster, sooner. In fact, I do wonder what potential the motor has – if Burt Munroe was still alive, what could he have extracted? Inside the powerplant is a six-speed gearbox which is a delight to use. I was disappointed the clutch and brake levers weren’t adjustable, but at least the lever-pull effort requirement is pretty low. The gearbox is slick and easy to use, the clutch smooth and hassle-free. Most Scout buyers will be back to their Indian dealer for at least a few accessories. For a start, there’s no pillion seat or rear foot pegs, and the Indian Scout is so good-looking friends will want you to take them riding. The riding position – like all cruisers – is tough going at highway speeds, so adding a screen will be popular, and touring bags are available too. Indian had a bike with all this fruit on display at the launch, and it was popular with journos who love all that stuff – but if I was going to use it regularly like that, I’d buy the Chief Vintage. The paintwork on the Scout is available in four colours – Indian Red (which is dark, not fire engine), Silver Smoke (some would describe it as grey), Thunder Black (yep, black) and Thunder Black Smoke (matt finished black). Of the bunch, I liked the Silver Smoke. It’s close enough to the same colour as the frame (all the models have the same colour chassis) and the brown seat (something of an Indian icon) suits the colour well. Which Indian Scout will you choose? At $17,995 ride-away, the Indian Scout offers excellent value for money. It’s comfy, capable, attractive and offers excellent performance – whether you’re comparing it to other cruisers or other twins. And at the same time it’s remarkably easy to ride, and would well suit anyone moving up to their first big bike. In standard trim it’s pretty lean on the standard features, with no pillion or touring capability, but that can be remedied with some loot spent on items from the accessory catalogue. I really liked the Indian Scout, it’s a lot of fun to ride, has a riding position which encourages fun without promoting indecent speeds, looks great and the price is very reasonable.